Earlier this year, we found out that dogs can be trained to successfully detect cancer on the breath of humans — but we're still not sure exactly what smell it is they're responding to. Now a company in Spain is working on a sensor to do the same job, and are discovering what biomarkers indicate a cancer's presence. 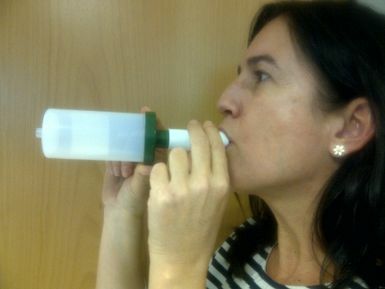 In conjunction with Donostia Hospital, the company Tecnalia has been trying to identify signs of cancer on your breath. Unfortunately, it's not a single biomarker that screams "here's the cancer", but rather a range of them, which can boost from 10- to 100-fold in cancer patients. The company used gas chromatograph/mass spectrometry on breath samples from patients at the hospitals to identify the relevant compounds, and are now developing sensors to detect them. The hope is that these new sensors will be able to catch lung cancer early on, before it presents the traditional symptoms that would alert doctors — and a small sensor is a lot more portably than a sniffing dog.